Here’s a somewhat obscure but interesting and often useful feature of SwordSearcher. 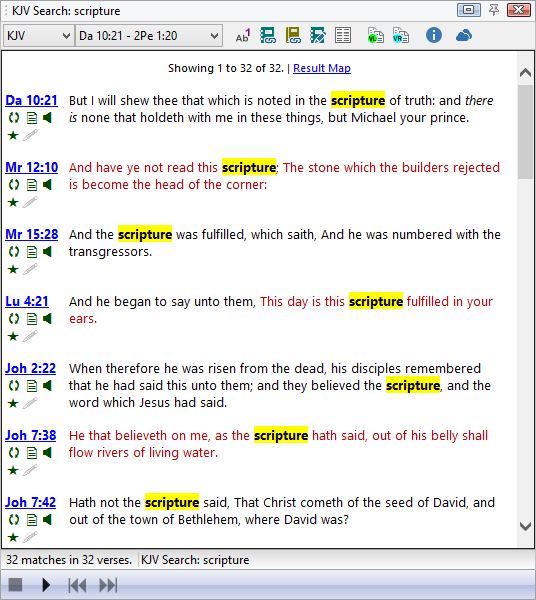 The Passage Analysis feature (added in version 7.1) gives you lots of details about sections of the Bible, such as a book or group of books. (See this detailed video for details.) 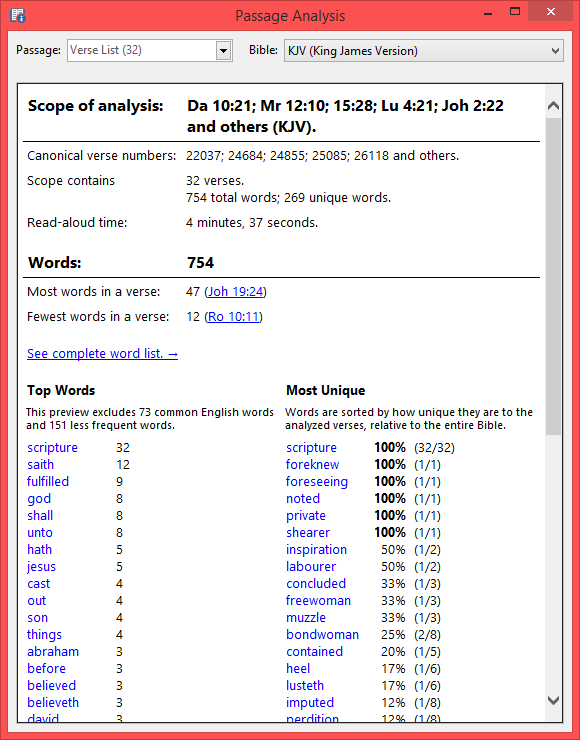 Information includes a full list of words ranked by frequency of “uniqueness” to the passage, word count, versification metrics (number of chapters, most verses in a chapter, most words in a verse, etc), and more. The Passage Analysis tool is normally opened from the Search menu. 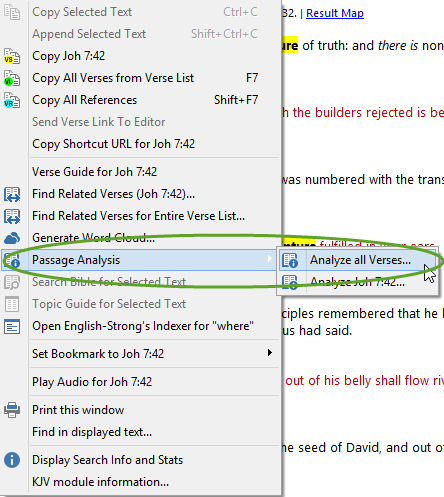 Right-click menu for verse list, Passage Analysis, Analyze all Verses. This can be quite interesting. For example, take a look at the “Most Unique” ranked word list. Scripture is the first word in the list, because that’s the word we searched for, so every verse in the Bible appears here. But right below that we can see that the words foreknew, foreseeing, noted, and private only appear in verses that also have the word Scripture. Now this may or may not carry some significance, but the only way to find out is to start studying. 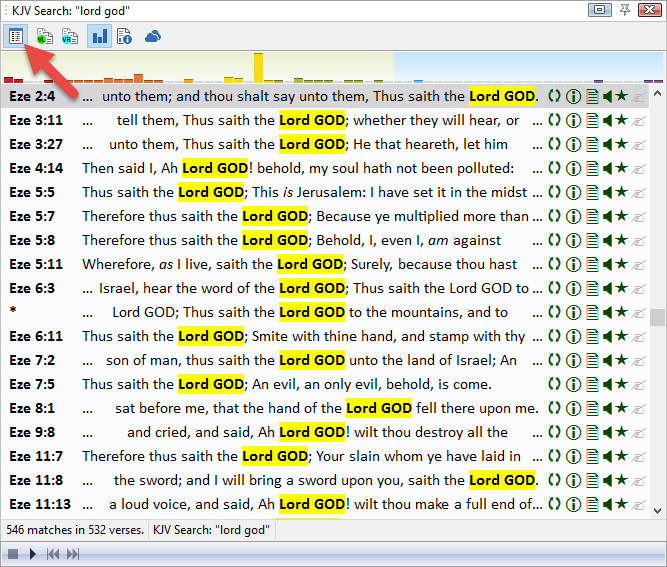 Again, be sure to watch the video demonstrating the use of the Passage Analysis tool to see if this could be useful with any of your own Bible search results!